Independent certification and testing is extremely important to Bereco, supplier of high quality, high specification windows and doors, and after a recent switch, it’s Bluesky Certification who is delivering the complete package. “We do a lot of product testing to give customers complete peace of mind,” says Nicola Harrison, General Manager at Bereco. “Timber windows have been maligned over the years, so we tackle the misconceptions about the quality and longevity for timber windows and doors with certification. That’s why we test all our products to a much higher level than other timber window and door manufacturers. We like the unequivocal proof that comes with the independent testing and certification. Our windows and doors provide low maintenance and an impressive 60-year life span. 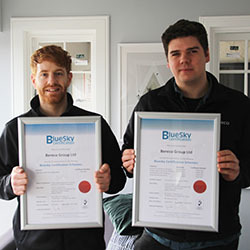 “With Bluesky Certification we have joined the schemes for General Performance Windows and Doors, and Enhanced Security Windows and Doors to meet the requirement for Secured by Design. Also, we have certification for our advanced coating systems, to provide independent verification of the quality of our finish. “We like to have everything backed up. Whether it’s for commercial customers or trade, we are always looking for ways to make our high-performance windows and doors stand out. The next one to be added is Bluesky’s acoustic scheme. We are launching it alongside a white paper on acoustics which includes information on links to health and wellbeing.